In order to understand what probiotics are, you must understand the microbiome. The microbiome is a complex network of bacteria, fungi, and microflora that reside primarily in the gut and impact the health of virtually every system in the human body. Probiotics are live, healthy bacteria. By adding beneficial bacteria in the form of Biome Actives, you are giving your microbiome the boost it needs to function properly. Prebiotics are types of fiber that feed probiotics. They keep healthy bacteria fed and flourishing so that they can carry out their important role in the gut. Bacillus coagulans is an extremely strong and resilient strain of bacteria that can withstand extreme environments. 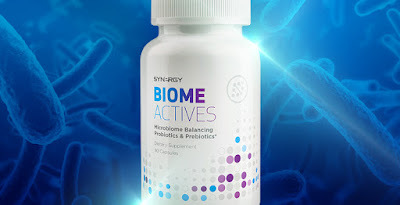 Synergy uses this type of probiotic bacteria because of its ability to thrive within the body. Additionally, Bacillus coagulans helps the microbiome to optimize the body's pH balance. What's more, scientists in Synergy's quality assurance labs conduct multiple tests on the Bacillus coagulans to verify that they are both effective and free from contaminants. A machine called a Bactometer is used to detect micro-contaminations and any other harmful bacteria in the Bacillus coagulans. Then, it's tested in petri dishes and placed into incubators for 5-7 days to confirm healthy growth. If the bacteria does not sustain proper growth or if any contaminants are found, it is rejected. At the Hughes Center for Research and Innovation, our products are put to the test in clinical trials and patient studies. Biome Basics is a key component of the Fortify program which has been independently reviewed and clinically studied to produce life-changing results. Click here to view the results of the Fortify clinical trial. Our labs and our state-of-the-art research center are just two of the many ways Synergy is able to keep its promise of producing only the highest-quality, most effective products. Purify program use: Take three capsules daily. Fortify program use: Take three capsules daily. Protect program or maintenance use: Take one capsule daily. May be taken with a meal or alone. Capsules may also be opened and sprinkled on food or mixed in beverages.